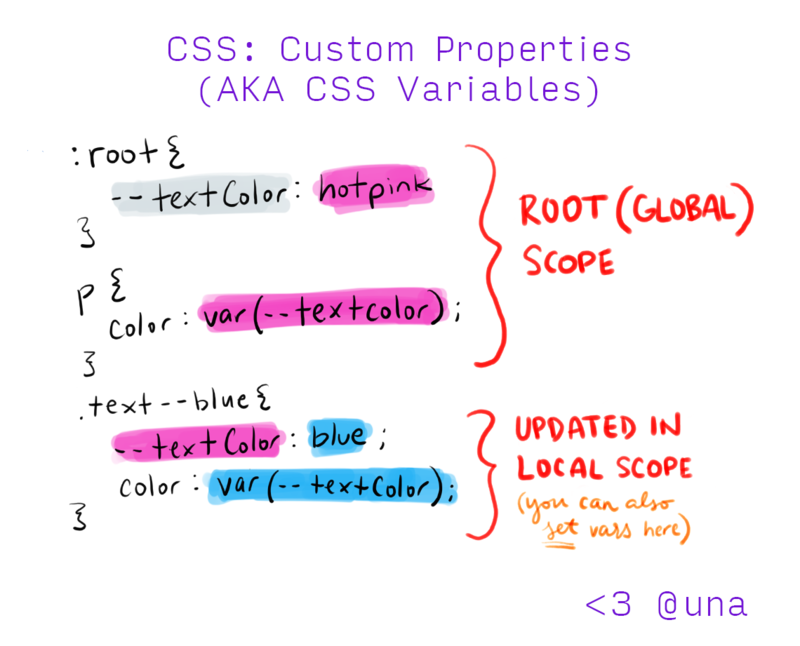 CSS Custom Properties (also popularly called CSS Variables) are here! This is really exciting because we finally have true variables in CSS! What do I mean by true variables? I mean variables that can be updated and altered dynamically in the file. While we had “variables” with pre/post-processors (like Sass and PostCSS), these “variables” got compiled into CSS and didn’t have dynamic capabilities to update their content. This isn’t true with CSS variables, which truly store updateable values. Lets talk for a moment why dynamic CSS Variables are so much better than what we’ve had before. That’s just one example of many! David Khourshid is doing some really interesting explorations using React and JS Physics Libraries to identify values which he then passes back into CSS variables. He gave a great talk about this at CSS Conf EU recently,. Another note that’s really cool about CSS variables is how specific we can get within property values. While we previously had to use separate declarations for border properties, we now can use variables to update any portion of a property, including shorthand properties like the border and properties that accept an unknown argument list like drop-shadow and gradients. In the example above, we’re writing a property to override a previously stated property, increasing specificity, file weight, and cluttering our codebases. But with CSS Variables, we no longer need to override entire base style properties! We just update their variables! Similar to the one above, most current examples of CSS Variables in docs, articles, and demos, use the :root of the CSS file to initiate and access variables. 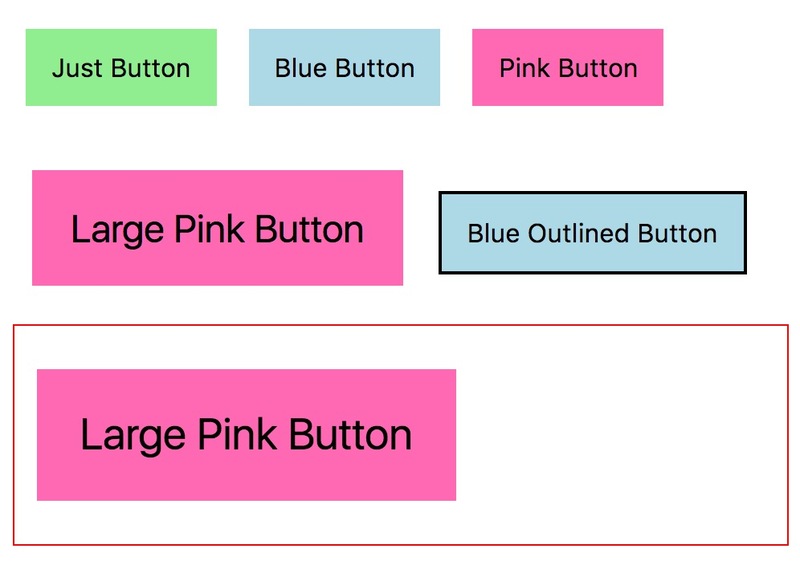 Leveraging CSS Variable scope improves the size, specificity, & semantics of our stylesheets. That’s a lot of alliteration! For example, --buttonBgColor isn’t something we needed to put in :root as a global variable (in the earlier example). A cleaner approach would be to rename that variable to just --bgColor and place it within the <button> component. This makes it more tightly coupled with its parent component, and makes more semantic sense in its ordering within the CSS file. A good general rule is as follows: Use local CSS variables until you need a global variable. Then, work your way up the tree. This reduces a massive list of CSS variables from piling up in your :root and makes the code much cleaner when building design systems and custom properties. Note: We can and should still leverage :root for global variables, like base color styling and sizing resets, but locally scoped variables reduce specificity, thereby reducing size, and also increase semantics. It’s also interesting to note that you can use default values to stub variables in case they don’t exist yet. var() gives us this capability by accepting two arguments (and can be nested within itself). In the example below, if --bgColor is not defined, the card will take the primary color (red). So we can potentially remove step 2 from the base style for .button and just update --bgColor in the modifiers (if we wanted the base button to be the primary color). So just to demonstrate with our example, lets give .card a red border and apply it the above code. We can see that the large pink button is even larger within our makeshift card. CSS Variables are widely supported in browsers today, though support is lacking in Internet Explorer, and Edge is still working on it. However, there are two alternatives if you need to support those browsers and want to get started today. Using @supports is definitely an option, but may be difficult to wrangle for a functionality like CSS variables (it works really well with Grid though! ), so sending a backup value may be a better solution. This is redundant for now, but it allow you to slowly ease into using some CSS Variables within an existing codebase, making it easier to refactor once support catches up. tl;dr: CSS Variables are super powerful, and scoping them locally makes them an even more powerful tool for clean, modular design systems.